The Tea Merchant is a new online tea company offering a range of teas and teaware with a focus on organic and fair trade. I recently reviewed their green kukicha, and I have a few more coming soon. I met founder Joey Landford at the NY Coffee and Tea Festival. I was intrigued by their teas and his new Kickstarter for an innovative tea tumbler. He is friendly and offered to answer a few questions, so we had a cheerful email exchange. TH: How did you discover tea, and when did you start drinking it? JL: I started drinking tea back in college but I never could really get into it, as I was too busy going to school full time and working full time to pay for school to take the time to enjoy tea. It was not until I moved to Japan that I started to really appreciate tea more. Drinking tea everyday with every meal became commonplace and I started to explore tea much more when I lived there. TH: Why start a tea business? How long ago did you start, and why? JL: I started The Tea Merchant about 9 months ago. I started it because I could not find work after being laid off. So I decided to take all my savings and create my own job that I would love. The result was The Tea Merchant, and this led to me designing my tumbler. Its been an enjoyable, stressful, fulfilling experience so far. TH: What is your favorite part of running a tea business? TH: What makes The Tea Merchant different from other tea stores? 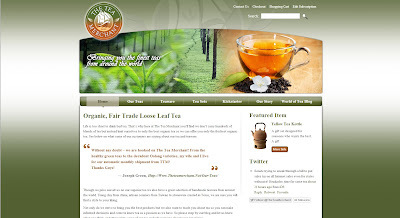 JL: The Tea Merchant is different in that I focus more on Organic and Fair Trade teas. You’ll also find that my teas are more subtle and not overpowering like other companies. Balance is key in teas and my blends all will focus on particular flavors or style while not losing the fact they are still tea. Take my Silk Dragon for example it is a vanilla Oolong with marigolds that even if you take the vanilla out of the blend the oolong can still stand on its own. This means every steep offers a different, tasty experience. TH: Where do you source your teas? JL: My teas are sourced from all over, China, Japan, and India primarily. I look for Organic and Fair Trade estates when possible but I won’t sacrifice quality to achieve this. This always makes blending more difficult but it’s a fun challenge and I think the final product is better for it. TH: Tell me a little bit more about your tea tumbler kickstarter. Why did you decide to create one, and how long did the process take? JL: Well this tumbler is something I think the tea industry can really benefit from. It makes drinking loose leaf tea easy, and I found this was a major barrier for my very busy friends. Even if you’re not busy it’s still an easy solution for while at work or at home and it can even work with coffee! Being able to fully control steep times without having to remove the infuser is something we all can enjoy. I’m using the Kickstarter to help me get this product into production. Kickstarter will allow me to give awesome rewards and discounted tumblers to the people who like it. It’s a win win, as I get into production faster and people receive the product sooner and cheaper. A big thanks to Joey for answering all of my questions! If you have any other questions for him, leave them in the comments. A review of the Silk Dragon Oolong Joey mentions above will be coming soon, along with a few others!